“That’s Life” is a cruising catamaran and a great casual boat for any type of function, large or small, formal or informal. 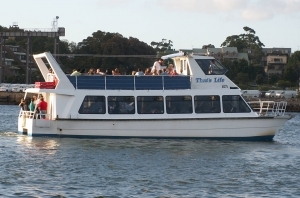 It boasts two large decks with extensive views from anywhere on the boat to make the most of the picturesque scenery of the long and winding Georges River. ‘That’s Life’ catamaran has everything on board for a great night out. The main deck accommodates a galley area, as well as the seated or informal dining room. That’s Life can take up to 110 guests in a cocktail style, or up to 65 for seated dining. There is a microphone, music system and dance floor onboard. This is one of the few boats of this size that will allow byo food and drinks.